1.ERASMUS POLICY STATEMENT (Overall Strategy). ESAD Asturias, principal aims in its international strategy, expand the horizons of trade for other cultures and countries of the European environment in educational and social interest. T do this, and always within the restrictive legal framework, as it has no autonomy and possibilities likes university, plotted a series of strategies seeking optimal achieve the objectives. We are interested to expand the horizons of trade to other cultures, we want to promote the knowledge of other languages, establish educational development projects with other institutions, promoting mobility making effective the right of free movement and show the students to Europe as the shared space of interest between different societies glimpsing the possibility of a future career in the continent. Also, we want to promote our culture and pedagogical quality using the mobility of students and teachers as an example of educational excellence both our institution and our country. For this, we will establish agreements with other peer institutions, promote lifelong learning programs for teachers and students, promote knowledge of other languages, establish educational development projects, network with sponsors and financial institutions, transparency measures and update information about processes curricular and recognition of mobility activities, improve student plans to accommodate mobility and handling. In the reality of our educational community, we limit the use of the program to student mobility for studies (SMS) and teachers (TSA), as we are a relatively small organization, and we want the action to be performed have the required quality and respect the code of good practice, as the impact on our institution will be great. Wanted agreements with the European institutions with a curriculum and pedagogical support constructive ours. This will hold talks, an analysis of curricular, facilities and arrive at a consensus on the basic lines of the agreement. Given the exceptional nature of these studies, few countries offer some artistic studies in Drama, geographic area, partner search is greatly reduced and limited. Even so, try to establish agreements with institutions in areas compatible with our society and has also easy integration of students in the host country. It also takes into account our ability and administrative restrictions as a center of Artistic Education and geographic areas accessible seek exchanges. These agreements will enable mobilities that are pedagogically beneficiaries and also enable learning of European languages, an awareness of European community building, improved cross-cultural values, promotion of European cooperation in quality for development comparable criteria and methodologies, a settling into the Community system of credit education, validation and recognition and promotion of the values contained in the Bologna Declaration to contribute to the construction of the European Higher Education Area. 1.2. Institution’s strategy for the organization and implementation of international cooperation projects in teaching and training in relation to projects implemented under the Programme. Our institution shall apply the student mobility actions for personal study and teaching, so that will be applied and incentivate the strategies related to these two aspects. We aim to improve the organization staff to coordinate the program in the institution with several reportable aspects: Increase and recognize the time commitment, because in this type of study, the coordinators are teachers of the subjects of the institution who devote a small portion of their time coordinating Erasmus. Increased operational capacity in terms of language teaching. Here, we find a clear and strategic goal to achieve, and have the actual ability to organize language courses for students inn and out without excessive cost, and that being a Superior Artistic center, do not have the possibilities or that the university autonomy, but if we are to deliver the quality that the program needs. No doubt this look will increase the quality of the mobilities in turn will enrich the institution, giving it greater operational capacity not only as the Erasmus program, but its general mechanics, clear example of how this program improves the institutions in all aspects. Strengthen international projection of the center. 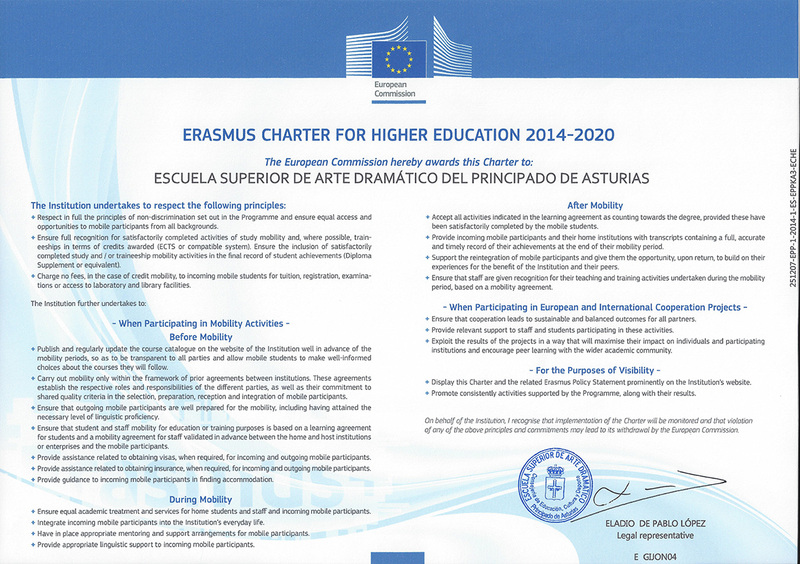 By getting the letter Erasmus, the center will strengthen what worked in recent years and progress in the number of mobility and quality of these, as our institution despite being a small school community, is a culture engine, and is a perfect instrument of European cohesion by the type of education that work. 1.3. Expected impact of our participation in the Programme on the modernisation in Esad Asturias in terms of the policy objectives we intend to achieve. The modernization of the institutions also involves projects and goals that being achieved in the case of our participation in the program, we expect that differences we have with respect to the university as the legal framework that protects us, gradually decreasing by program needs. In this way our modernization and development is linked to the program. Our studies, immersed in the program will provide students with an international projection and sustain the need for their teaching, attracting the professionals of this art to formal education, thereby increasing artistic professionals have a formation in higher education. Currently the number of actors without formal education, is high, the impact of these studies counting internationalization, surely attract the higher education community in. The quality and relevance of our studies are also conditioned to the program, as art institutions will be equipped with the tools of those without by the legal framework. 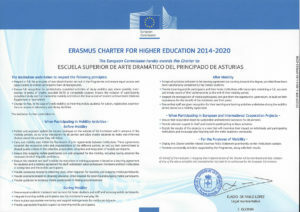 In this way, the teacher is motivated by international actions which gives us the program, students are also encouraged to learn europe, other cultures and get a broader vision and building real community, seeing in educational compatibility between European institutions, thus placing our institution in Europe in a more conscious form. Funding and governance are also improved as the institutions under which we respond to our legal framework will institution providing the necessary tools to carry out the program. In this way, the institution undergoes a process of modernization that is enabled by the impact that is having in implementing the program. – Copy of an identity card. The acceptance or refusal of the candidate reserves as decision of our institution and reported to the home institution 10 days after receiving the information.